In addition to the packaging options shown on this page - we can custom design a packaging solution for you. Now that you've designed your charm - it's time to think about how you'd like to present it to your guests. 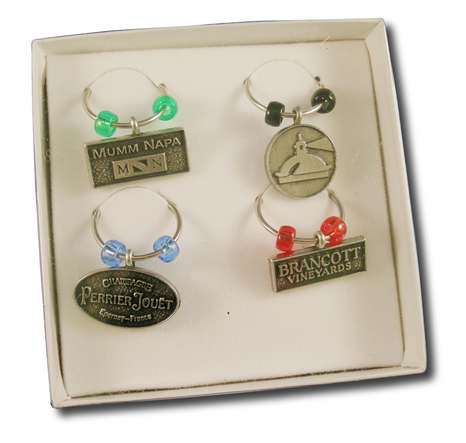 Charms are often distributed in sets - for guests to bring home and use at a later time. 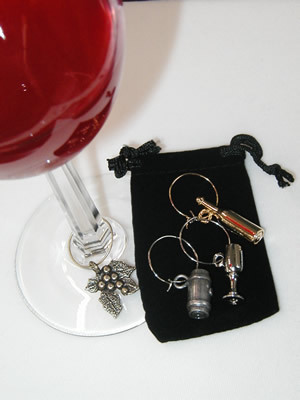 Two popular options are a velour pouch and a gift box..
Our gift box displays either 4 or 6 custom charms. Charms are packaged on a white velour flocked insert. The cover is clear and may be imprinted (ask your salesperson for details) Each box is $3.00 and includes insertion of your charms.